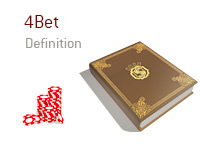 What is the definition of the term "4bet" as it applies to the world of poker? What is meant by a "4bet"? In poker, a "4bet" occurs when there is a bet, raise, re-raise and yet another raise. The last raise is known as a "4bet". For instance - let's say that you are dealt pocket Aces on the button. You have been playing very aggressively all game, and you believe that the other players at the table will not give you credit for a strong hand if you play it aggressively. A player in early position bets. Action folds around to you on the button. You put in a raise. The SB and BB both fold. After some thought, the player in early position re-raises (aka 3-bets). The action is on you now. You pretend that you are being put to a painful decision. After a couple of minutes of seemingly intense thought, you raise it up. This raise is a "4-bet". Following your 4-bet, your opponent pushes all-in and you snap call. Your opponent turns over pocket Aces as well, and you end up splitting the pot. For most players (especially casual players), a 4-bet usually means that they are holding something like pocket Kings or pocket Aces. Experienced players will use 3-bets and 4-bets to push other players off of hands, even when they are holding mediocre hands. For instance, a player holding a hand like pocket Tens may fold against a pre-flop 4-bet. This is why it is so important to try and figure out your opponent's tendencies at a table.